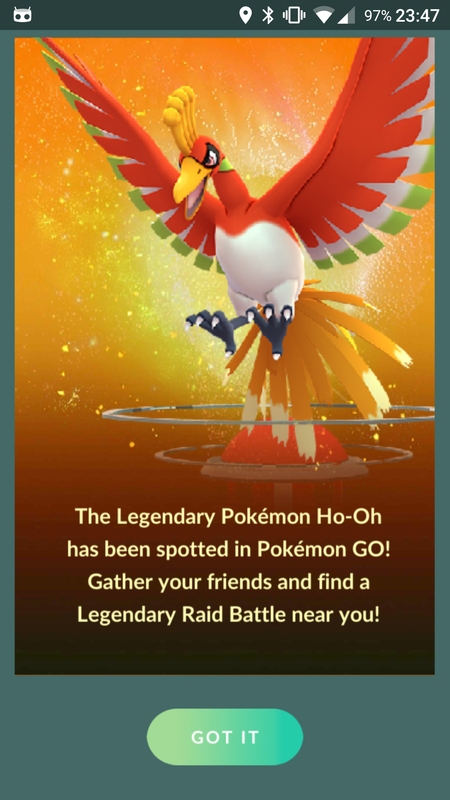 Home > Featured > Ho-Oh available as a raid boss until December 12th, no EX invite needed! Ho-Oh has been released as a Raid Boss around the world, following the immense success of the recently ended Global Catch Challenge! Ho-Oh will be appearing as a Legendary Raid boss until December 12th of 2017 everywhere around the globe. The Legendary Pokémon Ho-Oh has been spotted in Pokémon GO! Gather your friends and find a Legendary Raid Battle near you! In any case, be sure to read up on Ho-Oh using our Ho-Oh Raid Boss guide and prepare to raid the beast. Remember, you don’t need an EX Raid pass to raid Ho-Oh! The post Ho-Oh available as a raid boss until December 12th, no EX invite needed! appeared first on Pokemon GO Hub.